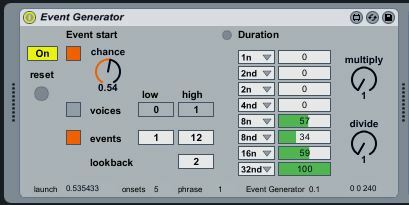 Event Generator generates MIDI events in real time. Whether or not an event occurs at a given time is controlled by three rules and the duration of that event is chosen from eight note values by means of weighted selection. The output pitch is fixed at middle C (C3/ 60) and the velocity defaults to 100. When only the chance rule is turned on and the clip is running, the chance dial controls the probability that an event will occur when the chance rule is operating alone. The lower the value on the dial, the less often events will be generated. When running with other rules, it acts as a “cap” on the other rule outputs. This dial can be automated within a clip or track. This rule only works when the event generator is used in conjunction with noodle send and noodle control devices elsewhere in the Live Set. Data from noodle control tells the event generator how many voices are sounding in the piece. If, when the clip is running and the voices rule is active, the number of voices sounding is equal to the value in the high number box, then zero will be sent. Voice counts between the low and high setting will generate intermediate probabilities. This is a “fuzzy logic” sort of thing which can be expressed by the phrase “if things get busy, shut up”. Each time this rule initiates, a pseudo-random value is generated between the values in the high and low boxes. If the number of events occurring during the lookback period (in bars) exceeds this value then zero will be sent to the launch probability calculation, otherwise 1.0 will be sent. Once the event count drops back to zero, the rule will re-initiate. This rule can be expressed as “if you’ve said too much, be quite for a while”. When these rules are combined, the overall launch probability will be the minimum of the three values generated by the rules. When turned off, all three rules send values of 1.0. So, if all three are turned off, event generator will produce a continuous stream of notes. Once the module has decided to create an event, it has to choose a time duration for it. These choices are controlled by the two columns of boxes towards the right hand side of the event generator. The first column of boxes are menus from which you can select the set of up to eight values, from which the generator will choose a duration. These durations are expressed as metrical values, relative to the tempo of your Live Set. The format is the same as that used by Max where 1n is a whole note/ semibreve; 4n is a quarter note/ crochet; 8nt is and eighth-note triplet; 16nd is a dotted sixteenth note and so on. The second column contains sliders which control the likelihood that the adjacent note value will be chosen. The larger the number on the green slider, the more like that its partner duration will be chosen. These values are called “weights”. If the values in the duration menus are too small or long for your taste, you can multiply or divide the chosen metrical value by any whole number between 1 and 16. This resets the lookback counter to zero and flushes any held MIDI notes. A reset occurs automatically every time the Live counter is set to 1.0.0.